Marion Dunn was used to life in an institution. The 1881 census records her parents as attendants at Exeter Asylum, and by 1878 Marion was working there too. By 1901 she was Head Nurse at Bristol Asylum, along with Dr Blachford, Head of the Asylum, and Dr John Phillips. When The Bristol Asylum became The Beaufort War Hospital during the First World War, Dr Blachford is promoted to Lt Colonel, RAMC and Dr Phillips becomes Major Phillips. The War Office recruited Anne Gibson, a senior nurse in The Queen Alexandra’s Imperial Military Nursing, as the first matron of the newly established war hospital. Marion Dunn is relegated to Housekeeper. 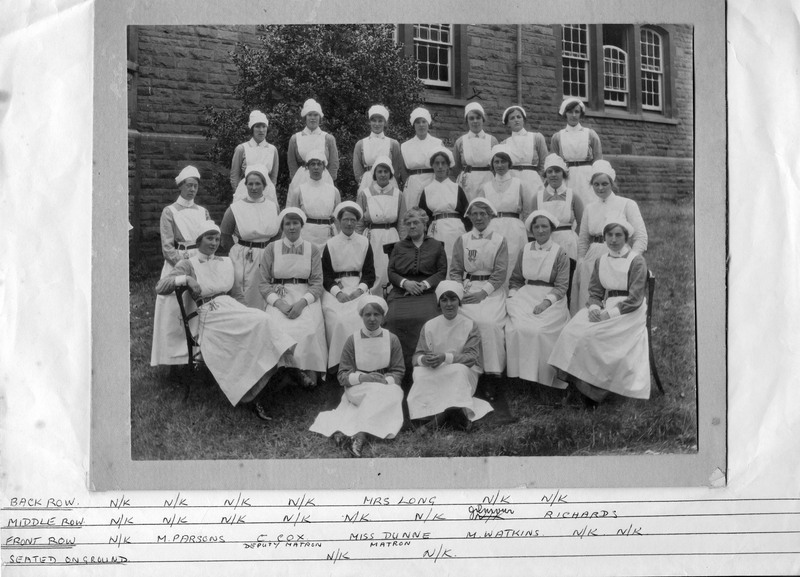 We have yet to identify Marion Dunn in the postcards, but we have this one photograph of her with the nurses. She married Major Phillips in 1925, and outlived him, dying in Wiltshire in 1947 aged 78.